I have just moved house. Well it was three weeks ago tomorrow but I’m still living out of cardboard boxes and mislaying everything (not just due to age, for once). I am reminded of other significant moves in my life: aged four in 1968 – leaving our bungalow in Leatherheard one morning, the magic of being taken to a house in Burpham near Guildford that same afternoon and finding all our furniture and my toys there: our new home where I lived happily for the next seven and a half years. We tend to categorise our life according to where we live. Doing so provides convenient chapters of memory and emphasises the underlying importance of home and place. But carving time into chunks can also over define these chapters so that the story ceases to flow one from the other. This is what happened when I moved aged eleven in 1975. I didn’t want us to move and remember scowling with hate-filled venom as my parents showed prospective buyers around. I thought my fixed, silent, demonic stare might somehow ward them off. It didn’t work, at least, not with Mr & Mrs Hunter and their curly-haired twin boys. They even had the audacity to arrive just as Terror of the Zygons reached its climax. As moving day drew near, I relented slightly and left a message under a loose parquet floorboard, wishing happiness to the Hunters and whoever followed them. I sometimes wonder if that strange little note was ever found. So on a cold Thursday 13th November 1975, I left school to find our optimistic, open plan 1960s’ home was no more. In its place was an austere 1950s, metal windowed house with an asbestos garage and mean little prefab outhouse. It wasn’t so far away from our old house but might as well have been a million miles. The floorboards were already up for re-wiring which didn’t bode well. Paintwork was utility ‘sludge’ green (as I called it) and the walls were the mock-Regency stripe of a boarding house. Ceilings were too high, windows too low. The rooms felt old, cold and the house comfortless, utilitarian almost institutional. It was the end of one chapter for sure but I didn’t want the next chapter to begin: secondary school, adolescence, exams, being bullied, feeling isolated, different… in fact it had already begun two months ago: I’d left my cosy C of E village primary of one hundred children and started at a 2,000 strong comprehensive that September. Our move only emphasised the split from that past. I asked my father to paint my bedroom lime green and purple in protest; much to my surprise, he did – almost drowning out the Regency stripes. Since then I’ve struggled to recover the story of life which flowed over that 1975 crevice, to try to spot the elements which had already appeared before the change. In fact, the seeds of adolescent disaffection had not just been sewn but were already growing up around me in my final two terms at primary school. A childhood culture of vim and vigour was giving way to a disaffection amongst the more precocious children. I can see how hopeless I was at football, how removed from the rough and tumble of most boys’ activities as I stayed on the sidelines with a few close friends. I can see how setup I was to fall. I’ve realised that ‘bad’ things would have happened anyway regardless of where we lived. 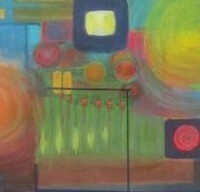 It’s just that our change of home allowed me to idealise the abode of childhood and castigate the haunt of adolescence. Looking back, as I have felt more benevolently towards my teenage self, I’ve almost learned to love the ‘teenage’ house too. To look for these common elements is important, I think. To remove some barriers, restore a little natural justice, try to see the true lay of the land from a more distant vantage point. And this move? Well, I suppose it’s the move from mid, middle age towards the early embrace of old age, given that I’m hoping to live here a long time. And I feel OK with that. A new life is emerging from the cardboard boxes that might be every bit as magical as the belongings which materialised in a sparkling new home back in 1968. Earlier this week, Friends Reunited announced it would be closing after sixteen years. This came as little surprise to me having tentatively joined the site as recently as September 2015 (always hopelessly late to the party). It took me until then to pluck up courage to face dæmons – or would they be merely ghosts? – from my (secondary school) past. What prompted me to join was a massive house clearance following my mother’s death – literally turning over the past – and, melodramatic though this sounds, a sense of my own mortality. No more time for prevarication and procrastination. I should just get on and do it. So I joined, immediately contacted five people and never heard a jot back. That could be because those individuals don’t want to be in touch but more likely, no one actually got my messages. Email addresses have probably changed half a dozen times since joining fifteen years ago. I really should have plunged head-in when the phenomenon was at its height back in those I ♥ the days of the early noughties (Friends Reunited was as much a product of new millennial nostalgia as it was a particular evolutionary stage of the internet). The news of closure prompted me to think that, far from the internet being preserved for perpetuity, it is rather a web of gossamer fragility, all too easily snatched away by the hands of fate. Those names from long ago, gathered together in the ether for what might have been a near infinite afterlife, turned out to commune in their virtual classroom for only the briefest of moments. Yes, the world has changed substantially since 2000 not least because of Facebook which allows for a far more interactive experience. It is true also that the very concept of Friends Reunited contained a built-in obsolescence. Having visited and posted a summary of your last ten, twenty of forty years, why would you want to make return visits to people who vanished from your life decades ago, very possibly for good reasons? But the site contained something of unique value. Nothing will quite replicate its coming together of individuals around communities of schools, clubs and universities in such a structured way. Friends Reunited, inadvertently perhaps, built up an organised anecdotal and photographic archive, establishing a picture of life in particular schools and of the changing educational scene in the UK across many decades. 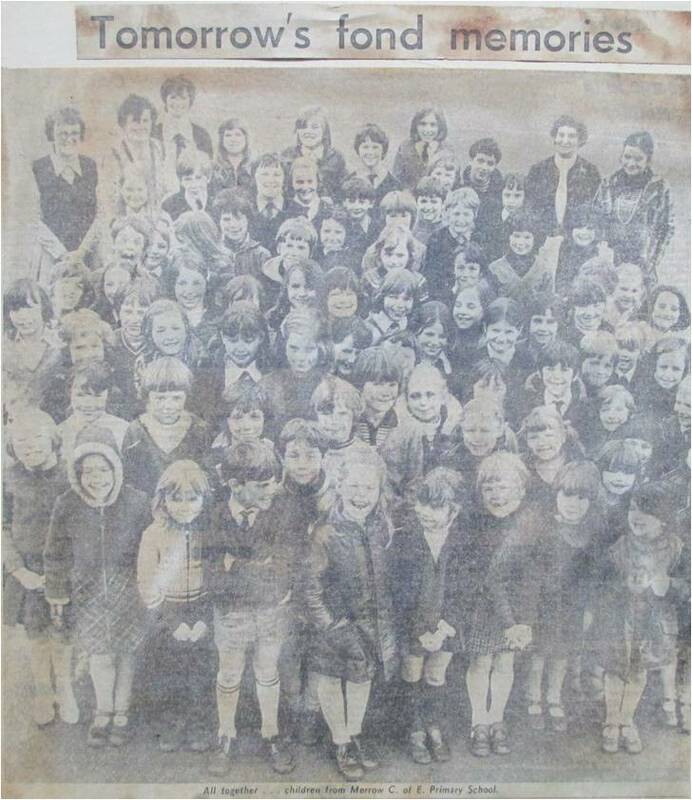 I had long known that somewhere I had a cut-out of an article from our then local paper, The Surrey Advertiser, from 1975, my last year at primary school. Last year, I found that article in the bottom of a cardboard box in the back of my loft where it must have sat for over a quarter of a century. With paper fading, yellowed by the glue from my mother pasting it onto hardboard over forty years ago, it seemed as if the children’s faces might revert to mere inky dots before my eyes. Aptly entitled ‘Tomorrow’s Fond Memories’, the article included a photo of the whole school, pupils and staff, gathered in the playground, smiling upwards at the camera. I remember us all being called together and the cheery press photographer coming to snap us that freezing February lunch-hour. The future of the Victorian village school was uncertain then though it still stands today, apparently thriving, albeit no longer as a C of E school. Last September, I scanned and posted the article on Friends Reunited under Merrow Street Primary School. Revisiting Friends Reunited yesterday, I found the site already a crumbling edifice. Like a building stripped of its remaining assets awaiting demolition, photos displayed only as a series of crude placeholders (a couple of lines from Don McLean’s Vincent came to mind – ‘portraits hung in empty halls, frameless heads on nameless walls’). What to do with this photo now..? It seems such a shame to return it to the loft for another quarter century. I suppose I feel some responsibility towards my mother for cutting it out and keeping it in the first place. And a debt to my old classmates too. How might they get to see this thing? There may be others who, like me, would feel a sense of joy at discovering it. But it’s difficult to find the clipping a new home. I could make a donation to the Surrey History Centre where, if accepted, it will be professionally preserved and perhaps occasionally perused by historians but never really open to the joy of accidental or unexpected discovery by those hundred or so ex-pupils – its rightful heirs. So I thought I’d show it here. I hope you find it poignant in its own right, even if the faces aren’t known to you. Amazingly i remember most of the names. (By the way, that’s me, back row, next to the head-mistress, Miss Potter). And if you are on here, get in touch!